Dr Stephen Munro from the Australian National University said the age and location of the shell suggests the pattern was carved by an even earlier human ancestor known as Homo erectus. "It rewrites human history," he said. "I guess this brings them (Homo erectus) a little bit closer to us because we can identify with deliberately-made markings." The landmark find originated in 2007, when Munro took digital photographs of the shells and later, after close examination, discovered one of them had a geometrical pattern engraved on it. 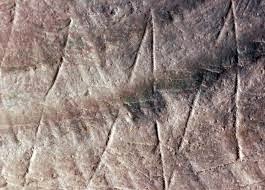 "This type of engraving in the archaeological record doesn't show up anywhere else in the world until about 130,000 years ago," he said. Munro also said the discovery points to the theory that early humans lived by the sea and ate shellfish rather living on grasslands and hunting game.